We could go the normal route about gamers and hygiene, but in this case the product is pretty interesting. For anyone that knows even the slightest bit about the fragrance market will know that having a product that captures the sent or expression of a celebrity or famous spokesperson is the key to being successful. In the past, the goal was the capture the perfect sent of a flower or to combine scents that work with the body’s natural pheromones, but today the goal is to smell the fragrance of someone or something you identify with and for many games Mega Man fits that bill. 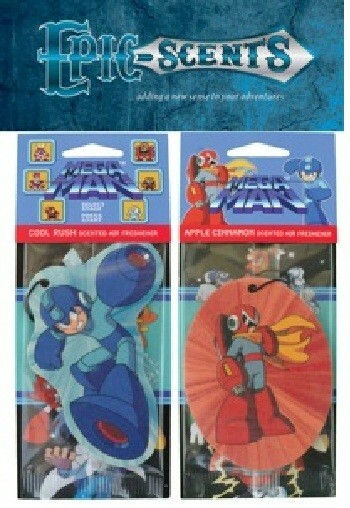 Epic-Scents debuted a new air-freshener line at Comic-Con that features two scents, one that is the essence of Mega Man and one of Proto Man. Just in case you were wondering Capcom had to give final approval to the scents before it was to be release to make sure it fit in with the Mega Man legacy. To make these scents gamers were asked, what are the defining characteristics of Mega and Proto man and from there the scientists went to work to capture the essence of the character in a scent that would be pleasing to gamers. For Mega Man his character has the heart of a child fighting as a man. So, his scent, called Cool Rush, (wait like Rush the dog?) features the smells of a tropical breeze, a musky note and a slight hint of citrus. On the other hand Proto Man smells like Apple Cinnamon since he is a rebel and nothing says rebel like the spicy sweet scent of Apple Cinnamon.